Today we live in a very evil time. Turkish President Recep Tayyip Erdogan has announced his plans for the formation of a new Islamic Union covering North Africa, the Middle East, and Central Asia. Erdogan wants to reconstitute the Turkish ruled Ottoman Empire. This Union is most certainly the leopard that is described in Daniel 7:6. 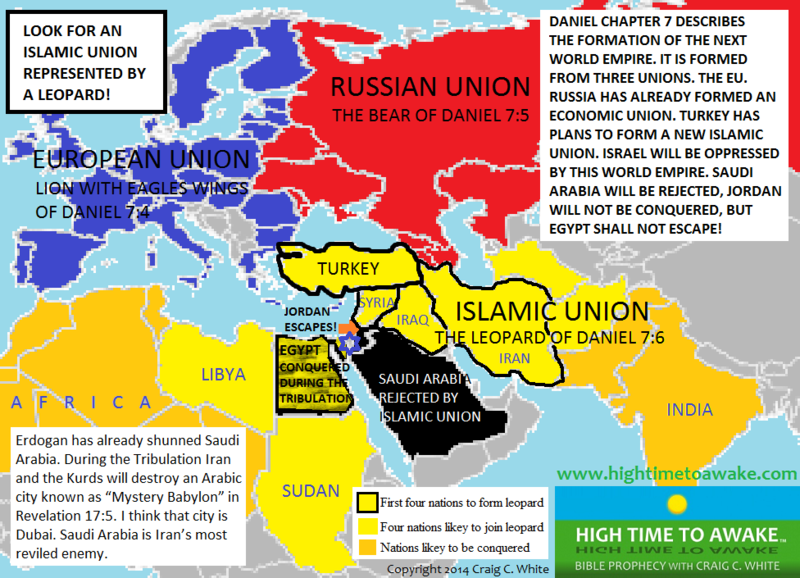 According to Daniel chapter 7 this Islamic Union (or leopard) will unite together with the European Union, and the newly formed Russian Union to comprise the next World Empire. Like I said Russia has already begun the formation of its end time Union. This Russian Union is described as a bear in Daniel 7:5. In Daniel chapter seven the new Union that will be represented by a leopard has four heads and also four wings. I have been expecting to see the formation of an eight nation confederacy but this new Union may instead be composed of eight tribal regions. The leadership of this new Union may even be composed of Islamic terrorist organizations. Turkey has been in league with Muslim Brotherhood, Al-Qaeda, Hamas, and Hezbollah leadership. In Daniel chapter 7 this new Union will even be given legitimate political status on the world stage. Once this Islamic Union is formed and certainly signified as a leopard then we are only a treaty away from the creation of the end time World Empire that will oppress Israel and then be destroyed at Jesus Christ’s second coming! Throughout world history the nation of Israel has suffered terribly under the rule of every past World Empire. Israel will suffer its greatest tribulation under the next World Empire. Erdogan has already shunned Saudi Arabia; singling the nation out as the enemy of the new Turkish led Islamic Union. This makes perfect biblical sense. As I read the bible it indicates that during the Tribulation Iran and the Kurds will destroy an Arabic city known as “Mystery Babylon” in Revelation 17:5. I think that city is Dubai. Saudi Arabia is Iran’s most reviled enemy. Some bible teachers are looking for a ten nation or ten king confederacy ruling over this new Islamic Union. But the bible doesn’t describe a ten king Islamic Union (or leopard). Instead it describes a ten king World Empire. When the EU, Russia, and the new Islamic Union combine then they will be ruled over by ten kings! The sun has been shining since Jesus Christ’s resurrection. The light of the gospel has shined throughout the world. But now we can see the sun sinking low in the sky. It has been High Time to Awake but soon the sun will set when no man can work! Read my commentary about Daniel chapter 7 and the formation of the next World Empire titled The Leopard is Upon Us! Now more than ever before you should read all of my bible prophecy books but start with this one! Pretty powerful stuff my brother. I’m in the process of rethinking my eschatological viewpoints so I won’t say how I feel, but I will say I am VERY interested, especially in the leopard coalition. I have much more to read and ponder so let me leave on that note. Thank you for blessing me with your insights. I am wondering what you think about the heavily militarized presence of russia in syria right now. You have done an outstganding job organizing the biblical scenarios. Hi Barbara. Russia doesn’t have a very strong military presence yet. I don’t see biblical evidence that Russia will save Syria. I think that they may prevent ISIS from destroying Damascus just long enough to allow Turkey to invade Syria and destroy Damascus. Turkey has 53,000 troops on the Syrian border. That is a strong military presence. When Turkey sends its troops into Syria then Russia will grab Syrian President Assad and retreat back to Russia. Russia and Turkey are on opposite sides of the conflict in Syria. Russia is more interested in conquering Ukraine and other regional nations. I am certain that Russia doesn’t want to start a war with Turkey.